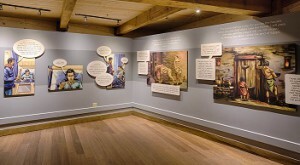 Ark Encounter opened a new exhibit, "Why the Bible is True." WILLIAMSTOWN, Kentucky, Feb. 24, 2017 – The popular Ark Encounter officially opened a striking new exhibit, “Why the Bible Is True,” this afternoon. At a special ribbon-cutting ceremony at the themed attraction in Williamstown, Kentucky (south of Cincinnati), Ark officials dedicated a massive 2,500 square foot exhibit, which fills much of the bow end of the Ark’s third deck. “Why the Bible is True” features a contemporary, graphic-novel style. The exceptional artwork allows guests to seemingly walk through the pages of a book. In the exhibit, Ark guests follow the story of college students seeking answers to their questions about life and the truth of the Bible, including: why is there death and suffering? “Why the Bible is True” is now the largest exhibit inside the Ark Encounter. Composed of 11 scenes, the realistic and cutting-edge art style highlights important questions that many young people and adults encounter, and provides real answers for a cynical world. The ribbon cutting was streamed via Facebook Live through Ken Ham’s Facebook page. With the excellent attendance already experienced at the Ark Encounter since its July 7 opening, coupled with the massive increase in group and tour bus bookings for 2017, the Ark is on track to reach the annual attendance forecasted by the renowned America’s Research Group (i.e., a minimum of 1.4 million guests each year). The Ark opened after many summer vacation weeks had passed, yet still managed to draw over 500,000 guests from July 7 through the Fall. Even this past Saturday (in the off-season), over 3,000 guests toured the Ark. The thousands of motor coach bookings for 2017 are far exceeding expectations. Hotel rooms in the region are hard to find for April and in the following months. Meanwhile, the Creation Museum is currently seeing double the attendance of the previous year. Located south of Cincinnati at exit 154 off I-75, the Ark Encounter is within a day’s drive of almost two thirds of America’s population. The 510-foot-long Ark will expand opening hours for the spring and summer seasons, remaining open until 7 p.m. through May 31, and until 9 p.m. through Aug. 31. Additional park expansions will be announced later this spring. In addition to the full-scale Noah’s Ark with three decks of world-class exhibits in over 120,000 square feet, the Ark Encounter theme park includes the Ararat Ridge Zoo (with petting zoo), zip lines, live entertainment, a 1,500-seat themed restaurant (which may now be the largest restaurant in America) and fair-trade shopping. The hours of operation and tickets are available at ArkEncounter.com. Both the Ark Encounter and the nearby Creation Museum in Petersburg, which will celebrate its 10th anniversary this May, are outreaches of the apologetics organization Answers in Genesis (AiG). For information on AiG and its multiple outreaches, visit www.AnswersInGenesis.org.